Mechanical Reasoning Formulas are a must know if you plan on taking a mechanical reasoning test. I have laid out some basic, must know formulas that will help you succeed your next reasoning test. The first formula we will cover is volume. The second need to know formula is for those leverage questions. I know we have already covered this in another area of the website but for simplicity and easy access I will add it here as well. You can have a look at our lever page here. Important mechanical formula number three would be the inclined plane. The inclined plane is a slanted surface connecting a lower point to an upper point. It's also fairly common that you will see a common screw in your mechanical reasoning test. Essentially, a screw is a cylinder with an inclined plane wrapped around it. In this instance, you would have to use a different formula. I'm sure you noticed that there are no examples or explanations shown on this page. This is strictly a formulas page. If you need examples, please be sure to sign up for our free eBook and our free sample questions. Also, check out our Mechanical Aptitude Highlight Series. 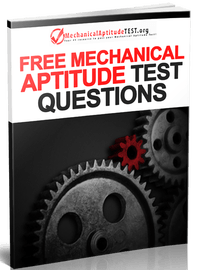 It has many GREAT examples to help you pass your mechanical aptitude test!